I installed the front sight a few weeks ago, no problem. Got out the sight pusher for the rear sight, had to stone the base of the sight a little bit to get a good start. Is this what others TFX Pro’s look like on the PCR slide? Not crazy about the gap, but the sight picture itself is awesome. That looks about right. Yes. 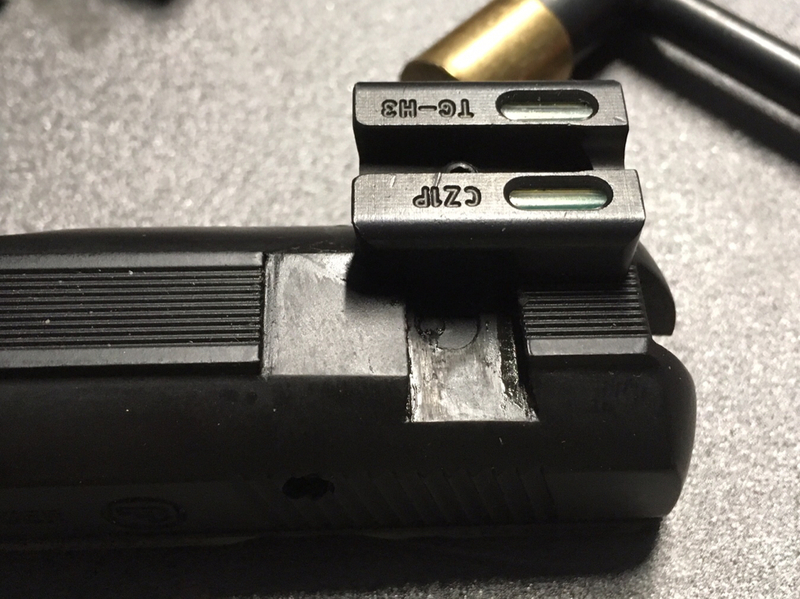 it doesn't cover the gap left from the factory snag-free sight. I know the front sight is longer than the factory one, but I guess you still get a longer sight radius. My other issue is that the set screw is too short. It loses thread contact before it bottoms out on the slide, so it’s not doing any “setting”. May have to figure out the set screw size and pitch and find a longer one. 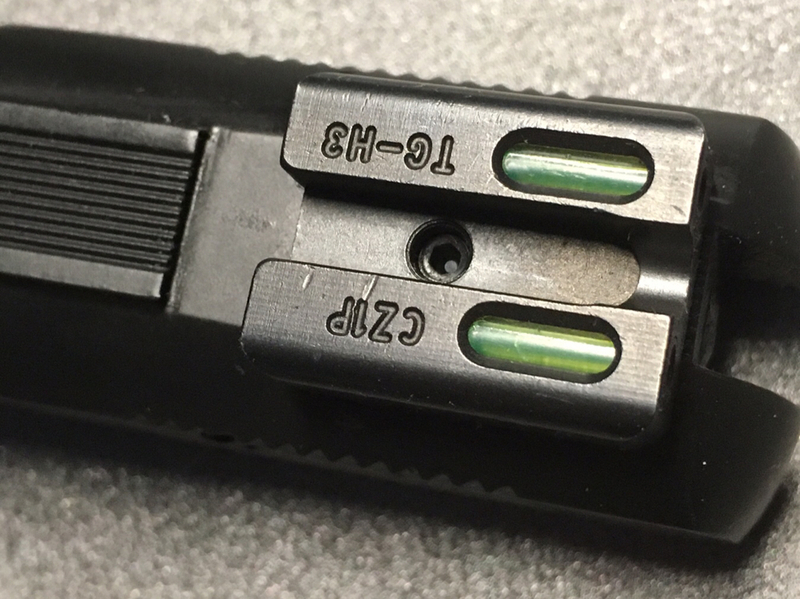 The set screw on the stock sight is longer but a different thread pitch. Yeah I may have to measure that just for fun but my gut feel is that it’s still about the same. Much easier for these old eyes to get alignment, so can’t really complain about that! It seems you would have plenty of threads on the set screw and the sight. Even though you sanded the bottom of the dovetail, I don't think it was nearly enough to cause this problem with the threads. If I were you, I would contact Truglo to see what they say. Yup, just dropped them a note. If you look at the top pic, there's a "divot" in the slide under the rear sight right where the set screw is. Only lightly stoned the bottom surface, no sandpaper! He said the supplied hex tool didn't totally fit the head of the screw and he didn't know it was slipping off. He got a better hex tool and said the set screw is now tight. Someone else said the screw size was M3x0.5x4. So he said to try a M3x0.5x5 screw. If Truglo doesn't help, then you search for the M3x0.5x5 screw. I think the challenge is to find one with the same screw head. Yeah I'm actually not too optimistic that they will offer anything, so the screw specs are extremely helpful! 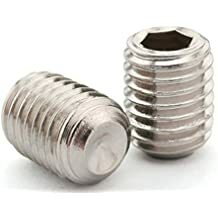 Doesn't that set screw have threads even around the head of the screw? If so, the one I linked at Home Depot (above) won't even work. Yep, the set screw is threaded "head to tail"
Pull down menu and select M3x0.5x5. It's a 20 count though. That should get you in the ballpark as far as finding the right one. But confirm with Truglo the exact specs of the screw before you buy anything. LOL, I just bought 2x of the M3 x 6mm for under 2 bucks from one of your eBay links... If I find out something else from TruGlo, I'm not out much. A 6mm long screw is less than a 1/4". You should be OK as long as the width and thread size correct.